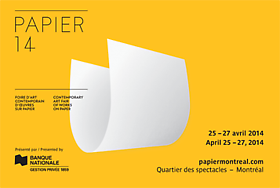 Montreal, February 14, 2014 – The Contemporary Art Galleries Association (AGAC) is pleased to announce that the Papier14 Art Fair will be held from April 25 to 27. For its 7th edition, the fair will return at the heart of the Quartier des spectacles, on the corner of Sainte-Catherine and Clark Street. The marquee tent will be installed on Esplanade Clark, which will enable the fair to grow in scope and welcome over 12 000 visitors in a period of three days. For its 3rd consecutive year, AGAC is pleased to associate itself with National Bank Private Wealth 1859 as presenting partner. Through this privileged partnership, Papier14 will showcase artists with the aim of promoting the access to contemporary art to a broader audience. Dedicated exclusively to the promotion of art on paper, Papier is the most important fair of its kind in North America. The event is a key catalyst for the Canadian contemporary art market and constitutes a unique meeting ground for the greater public, art enthusiasts and professionals alike. For its seventh edition, Papier is preparing to attract a larger number of Canadian galleries and collectors, thus demonstrating the liveliness of the city as a major center for contemporary art. AGAC is also very pleased to announce the participation of Karine Vanasse as spokesperson of the Papier14 Art Fair. Well known as an actress in Quebec, Karine Vanasse is passionate about culture and will lend her voice to the event for the first time. It is with great pleasure that AGAC unveils today the list of 44 galleries participating in this unifying event. This prestigious selection includes art galleries from Montreal, Quebec, Ottawa, Toronto, Calgary, Edmonton and Vancouver.